This is the life a Muslim widow is expected to have. Following the death of her husband, a widow is not allowed to leave her home or to work. If she remarries, her children are not permitted to live with her. For this reason, many Arab widows choose to not remarry and instead must depend on social security to provide for them and their families. This is the culture director Dalit Kamor opens a window to in the documentary Pickles, Inc. But rather than focus on the typical Arab widow, Kamor focuses her film on the uncommon experience of eight inspiring women. 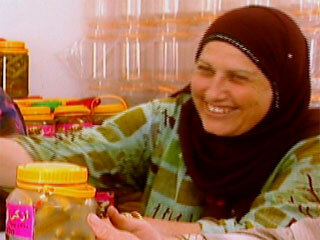 In 2003, Kamor stumbled upon a newspaper article about eight Muslim widows who had started a pickling company in Tamra, Israel. During the next two years, Kamor and an all-female production crew followed the women of the Azka Pickle Company as they learned business management skills and dealt with the emotional and financial stress of running their own company. But the road to success is not an easy one. Pickles, Inc follows the eight widows as they learn the ins and outs of running of business. In order for the company to succeed, the women deal with internal company disputes and work for 23 months without pay as they look for a business partner. Fatma, Samira, and Almaza, are the film’s protagonists. Their individual stories allow Kamor to paint a deeply intimate portrait of each widow, each of whom has an incredible story to tell. They are all in their 40s and 50s and widowed at a young age. Some were married at the age of sixteen; others were not religious until after their husband’s death. Personal moments, such as Samira’s reconciliation with her daughter and the period of mourning for Almaza’s 30-year-old son, make Pickles, Inc. a wonderfully touching documentary. But Pickles, Inc. is about so much just a pickling company in Israel and the eight charismatic women who defy societal expectations. And it is about even more than a simple act of feminism by women who never even heard of the word “feminism”. Pickles, Inc. is about the bond these women have formed with each other. The best scene occurs at the beginning of the film, when Fatma picks up three of her co-workers before they begin their day. This early morning car ride, in a way, represents the journey the eight widows have had together. Director Dilit Kamor received the award for Creative Excellence at the 2006 U.S. International Film and Video Festival. Pickles, Inc. will be screened at the Pioneer Valley Jewish Film Festival in spring 2008.